Canberra Day marks the anniversary of the official naming of Canberra, and the laying of the foundation stones for the Commencement Column. While the day continues to mark the beginning of the national capital, much about the symbolism of the day was hardly set in stone. The site of the ceremony at Kurrajong Hill was still little more than a sheep paddock on 12 March 1913. 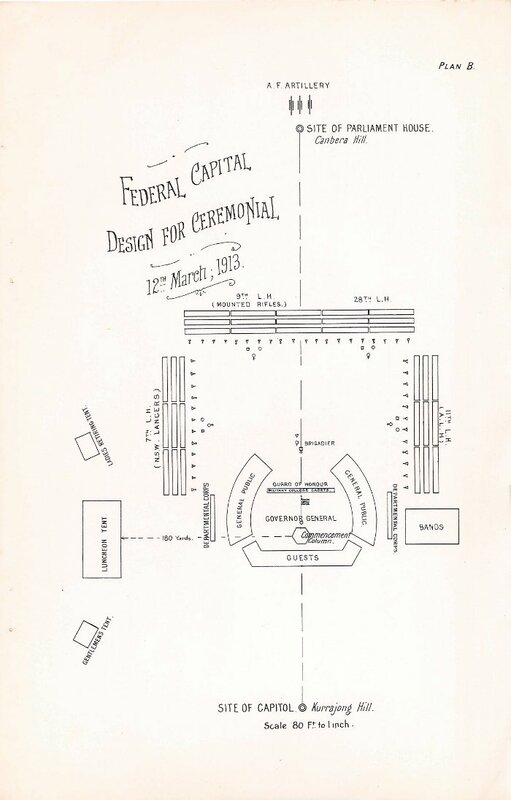 The program for the ceremony shows the location of the far-from permanent viewing stands, the ‘Luncheon Tent’, the ‘Gentlemen’s Tent’ and the ‘Ladies’ Retiring Tent’ which were ‘specially erected for the purpose’. 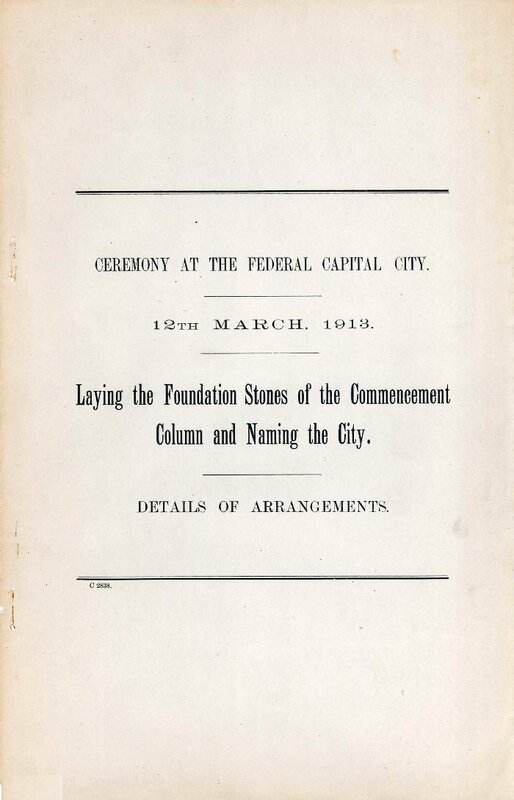 The program, entitled ‘Laying the Foundation Stones of the Commencement Column and Naming the City: Details of Arrangements – 12th March 1913’ is ArchivesACT’s Find of the Month for this month. The focus of the ceremony was much more solid than the on-site facilities. 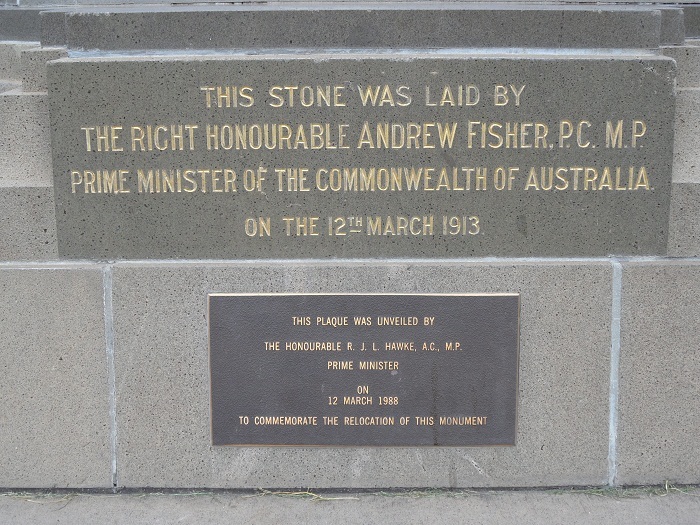 Governor General Lord Denman, Prime Minister Andrew Fisher, and Minister for Home Affairs King O’Malley each laid a stone in the base of what was to become the Commencement Column—a permanent symbol of the origins of the new capital. 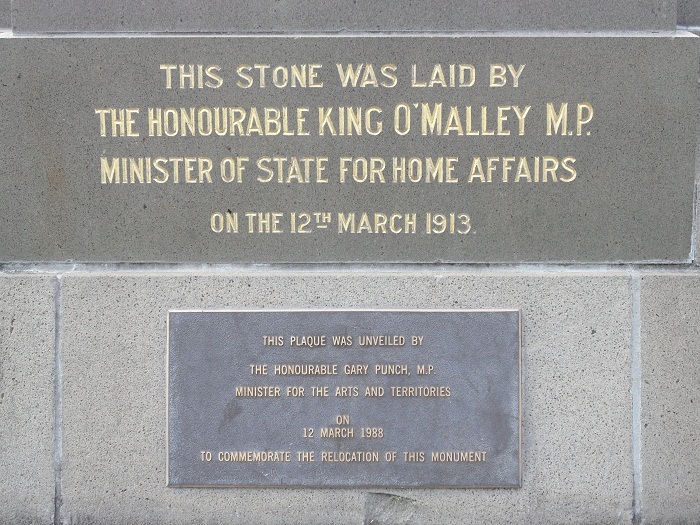 O’Malley, on laying his stone, pronounced it ‘truly and permanently laid’, but this was far from true. 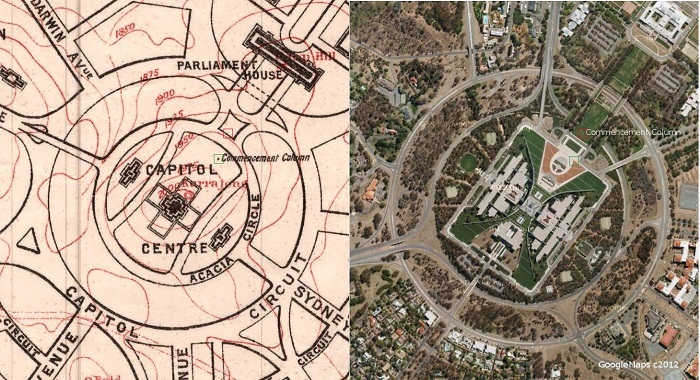 The stones were later moved to make way for the permanent Parliament House, and were re-laid on the 75th Canberra Day in 1988. 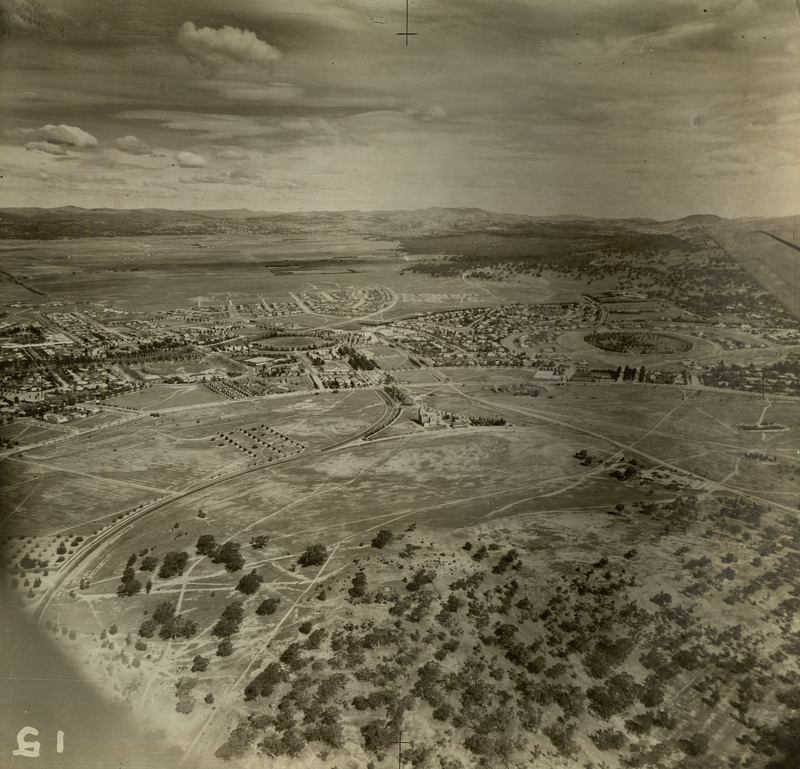 The Foundation Stones can be seen in their original location in the following aerial photo of Capital Hill and Forrest taken in the 1940s. The stones are in a fenced off area just below the centre of the photo. 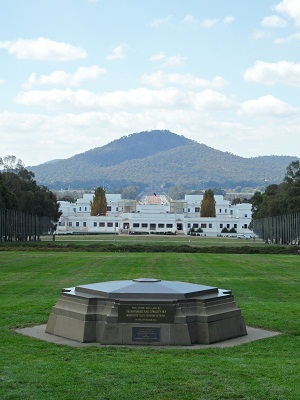 The Foundation Stones were relocated approximately 100 metres north to their current position during the construction of Parliament House in the 1980s. The following map from 1918 and the GoogleMaps image from 2012 shows the location of the Foundation Stones (labelled Commencement Column) marked with a red box. A green box in each image shows the approximate location of the Foundation Stones in the alternate image. Another temporary feature of the program provided on the day was the design of the coming capital. 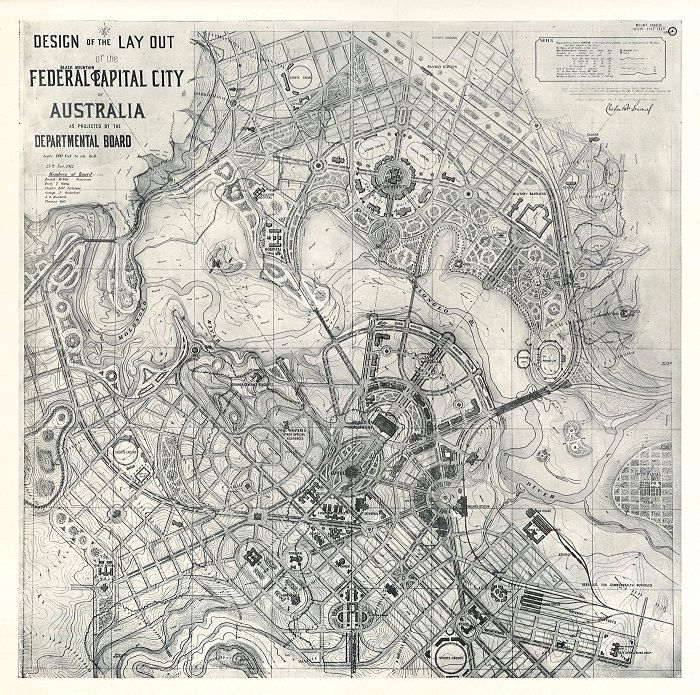 The design is not by Walter Burley Griffin, but one produced by the Departmental Board set up ostensibly to implement the new city’s design after the Griffin’s win was announced. Griffin scholar Paul Reid describes this as ‘essentially competition entry no. 10 [by Australians Griffiths, Coulter and Caswell] with a clumsy overlay on Griffin’s three axes’. This plan received wide criticism, and resulted in the Griffins being invited to Australia to work on the implementation of their original plan. A final alteration to the grand vision of the day was the fate of the Commencement Column itself, which the foundations stones were to support. As Canberra’s progress slowed during the war, plans to complete the John Smith Murdoch designed column were eventually abandoned. Happily, other features of the ceremony, including the naming of Canberra, have proved more permanent. The program of events for the day held in trust in the ACT government archives, is another enduring memento. 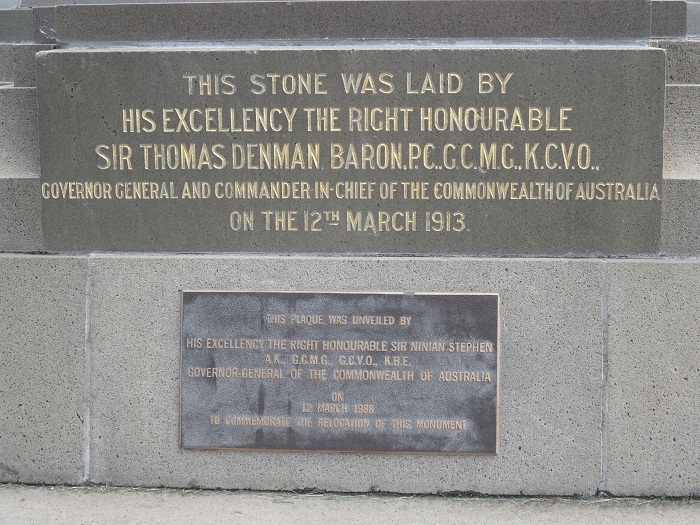 Three additional plaques were unveiled on the 12th of March 1988 to commemorate the relocation of the stones and compliment the original inscriptions.